Motorboat & Yachting: 2016 British Motor Yacht Show will see the launch of the Princess 49 – the first IPS-powered flybridge from the Plymouth yard. Princess Motor Yacht Sales has announced that the Princess 49 will be getting its public debut at the 2016 British Motor Yacht Show (May 20-22). The Swanwick Marina event will also feature models from Fairline and Sunseeker, but Princess Yachts hopes to steal the show with this new arrival. Announced at the 2015 Southampton Boat Show, the Princess 49 is the first flybridge model from the Plymouth yard to feature Volvo Penta’s IPS pod-drive propulsion system. 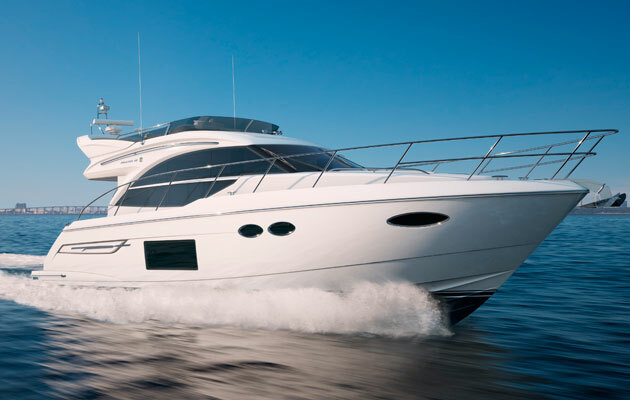 Princess is estimating a top speed of 35 knots, with an economical fast cruising speed of 30 knots.Key features include a pair of seating areas on the flybridge, with the aft bench converting into a sunpad. An icebox is fitted as standard, but the upper grill and wetbar is an optional extra. The main deck features a galley-aft layout with a full-height fridge/freezer, while the accommodation is split between a full-beam amidships double, twin bunk beds to starboard, and a scissor-action double in the bows. Princess fans hoping to get a first glimpse of the Princess 49 should head along to Swanwick Marina on May 20 for the official unveiling.